he book offers concrete guidance on best practices for promoting patient health in veterinary care, emphasizing specific techniques to prevent complications before they happen. 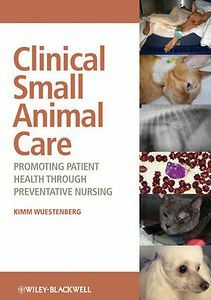 A practical, clinically relevant resource for veterinary technicians, Clinical Small Animal Care provides step-by-step descriptions of the core tasks associated with examining, nursing, and monitoring small animal patients. Taking a hands-on approach to the fundamentals of clinical practice, the book gives specific advice for how to perform tasks associated with patient care. Chapters begin with basic information on topics such as husbandry and nutrition, then move into more specialized information on applied nursing and the care of tubes and catheters. The final section presents information on caring for animals with a variety of conditions organized by body system. Clinical Small Animal Care: Promoting Patient Health through Preventative Nursing offers veterinary technicians and nurses with achievable steps for improving health in their small animal patients.